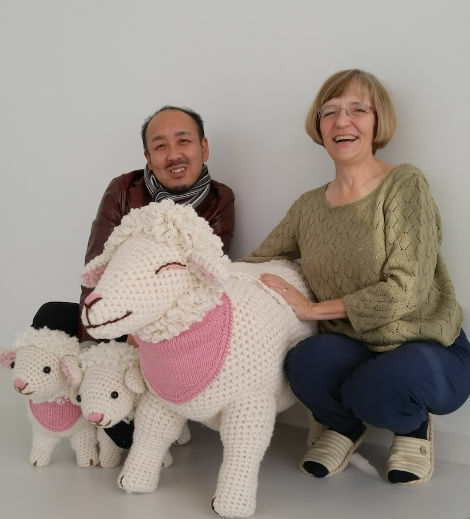 In Episode 25 of the Fruity Knitting Podcast we are meeting Gayle Roehm, who will introduce us to the pleasures of Japanese knitting design and give us some insights into reading Japanese knitting patterns. 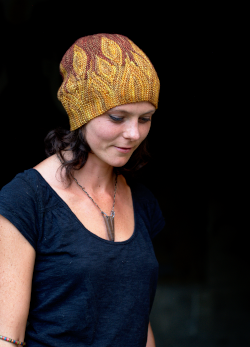 Our guest on Knitters of the World is Georgie, joining us from the Staffordshire Moorlands in the UK. We report back from our wonderful trip to the Edinburgh Yarn Festival 2017 with some footage and some purchases. We have a winner for our Cable Garment KAL, one finished project, one new project and one ongoing project, and lots more! 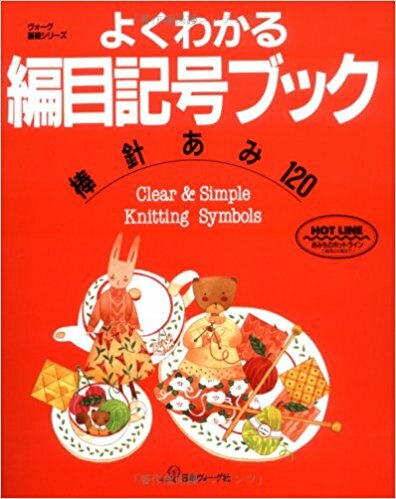 Gayle Roehm has lived and worked in Japan and speaks Japanese, and so has a natural advantage when it comes to reading Japanese knitting patterns. However, because of the way they are presented, Gayle says that any competent knitter should be able to work from a Japanese design. 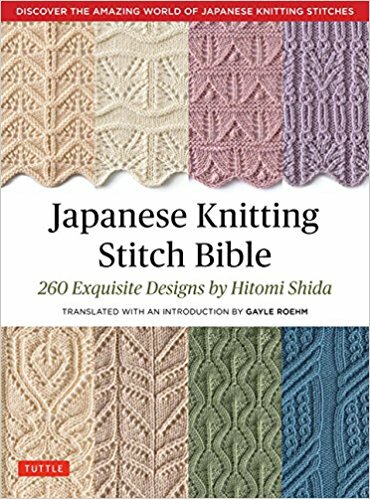 Gayle now holds classes on interpreting Japanese designs, opening up a world of new stitches and styles to English-speaking knitters. 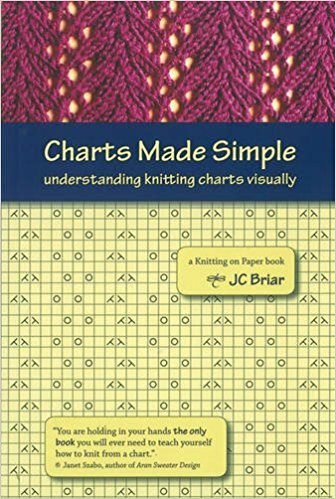 Whereas English patterns typically depend on a lot of text, Japanese patterns focus on a graphical representation, using stitch charts and standardized symbols to describe the stitches required and the construction of the garment. 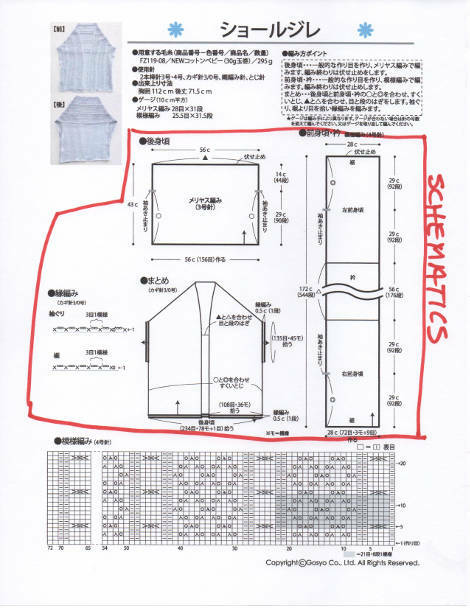 Gayle showed us the three main components of a typical pattern – a short description (in Japanese), schematic diagrams, and the stitch chart. Example pattern provided by Pierrot Yarns, showing the text description, schematics and stitch chart. Japanese designs are often original both in their stitches and in the garment construction. I have some names of designers who may have been mentioned by Gayle, but I can’t guarantee that it’s a complete list. 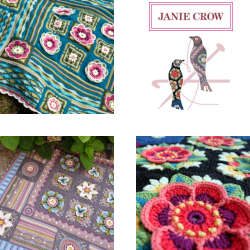 If you need more information, then you could turn to Gayle or the Japanese Knitting and Crochet group on Ravelry. Find a good way to keep track of where you are: post-it notes, magnetic board, or my personal favorite, highlighter tape. Whatever works for you. Mark up the chart if necessary: arrows showing which way to read a row, for instance. Do a swatch! Do the maths, and see whether re-gauging will be enough. 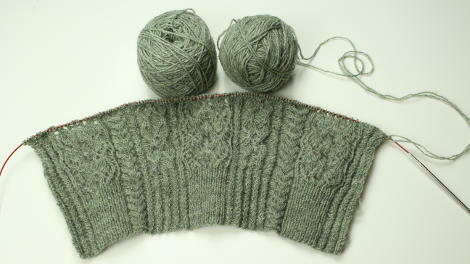 Description from Pierrot yarns of adding width at underarms and/or across the shoulders. 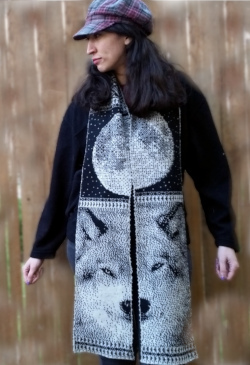 The Japanese Knitting and Crochet group on Ravelry, where Gayle is an administrator. Georgie lives in the Staffordshire Moorlands in the UK. It sounds very Jane Austen to me, but I’m not strong on literature or geography, so you probably shouldn’t take my word for it. Andrea called Georgie a beautiful English rose. I couldn’t say that, but I can say that Georgie has an extensive portfolio of beautiful creations. 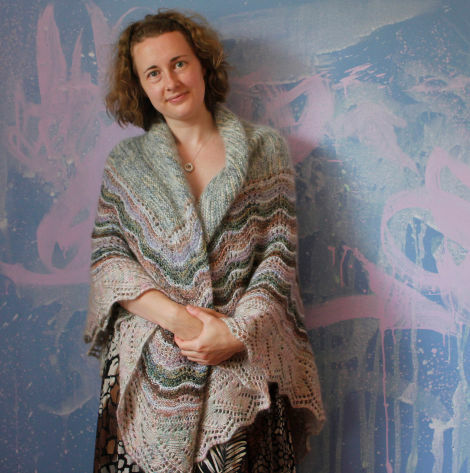 The idea of a Kate Davies colorwork blanket is lingering in our lounge room. Georgie documents her knitting work on her blog at birdsongknits.blogspot.co.uk, with beautiful photos and writings on her projects. 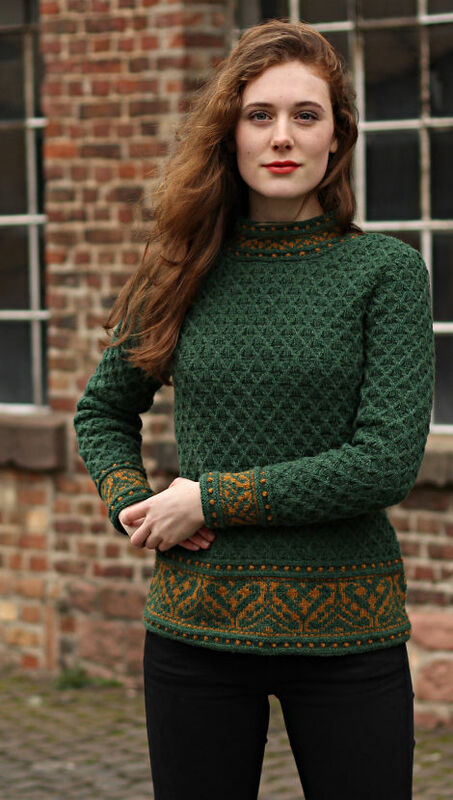 You can find Georgie on Ravelry as georgievinsun, and you can see more colours from Georgie here. Thanks to Georgie for sharing her work with us! 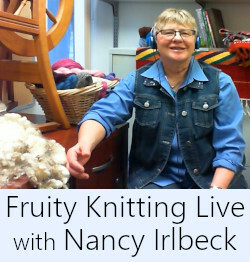 We had 35 finished garments submitted for the Fruity Knitting Cable Garment KAL. They are all beautiful so congratulations to everyone took part. Enjoy your cardies and pullies! 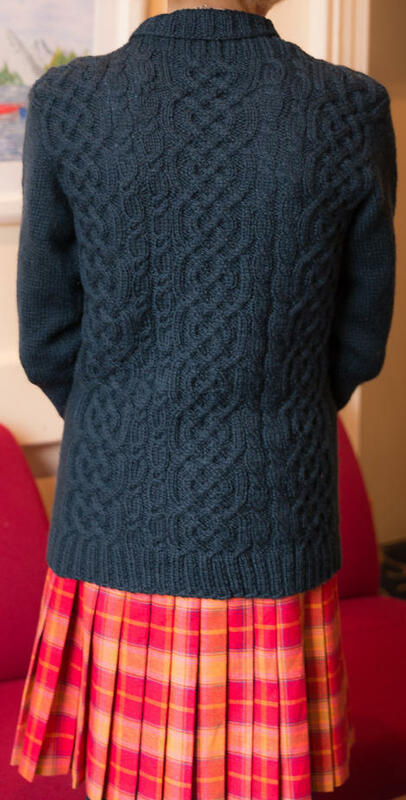 Beverley’s all-over cable cardigan – one of three garments completed! 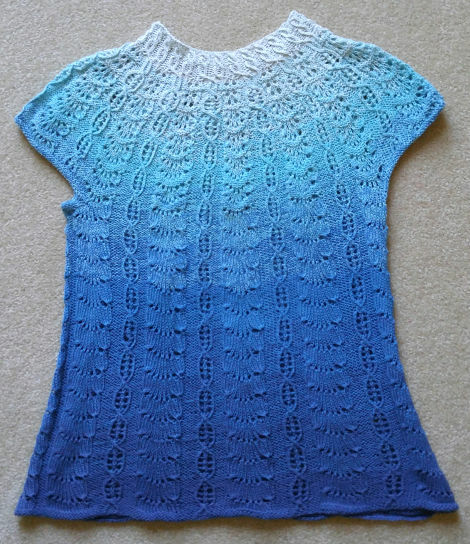 The winner of the KAL was Beverley – who submitted three garments, including a sweater for her dad! 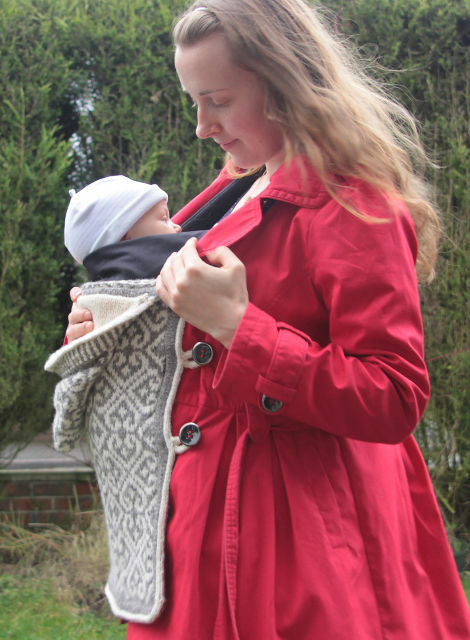 We are donating a copy of Norah Gaughan’s Knitted Cable Sourcebook. 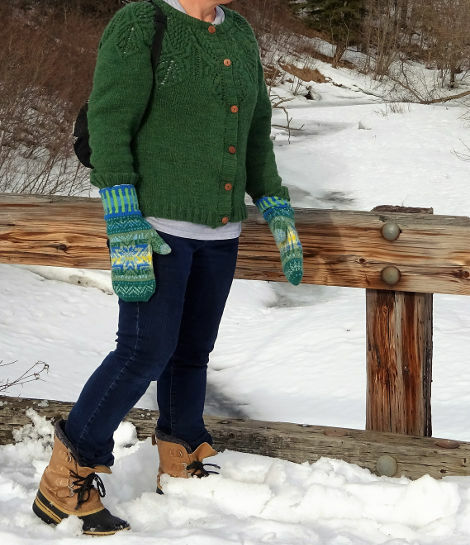 Also giving a special mention from the Extreme Knitting department to Sherri of North Dakota for modelling her cardigan in the snow. Bravo Sherri! For her next project, Andrea chose Daffodil, by Marie Wallin. Andrea wanted to use a yarn from a smaller producer, and Marie Wallin suggested the Hampshire 4-ply yarn from The Little Grey Sheep. 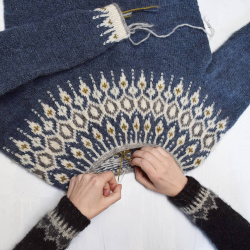 Both Marie Wallin and The Little Grey Sheep (in the person of Emma Boyle) were at the Edinburgh Yarn Festival, so Andrea consulted with both to make the final decision on the yarn. Marie Wallin has long been a major influence and inspiration for Andrea, and Emma Boyle is also clearly passionate about her work. It was great for Andrea to be able to meet them in person. Samite from Blacker Yarns is a woollen-spun yarn, 30% Blue Faced Leicester, 40% Shetland, 20% Ahimsa silk and 10% Gotland (from Sue Blacker’s Gotland flock). 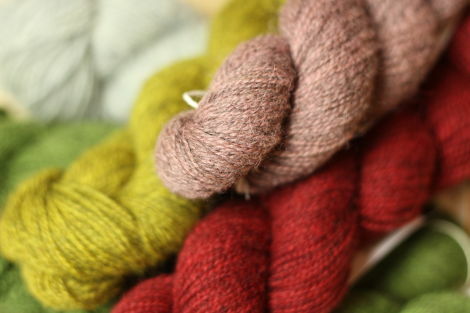 Apparently worsted-spun silk-blends can pill, and this yarn should avoid that problem. The silk used is “cruelty-free” Ahimsa silk. The Blacker Mohair Blend is their recommended sock yarn, and is a blend of Mohair and either Hebridean or Manx Loaghtan. The Mohair is soft but is also very strong, so is a great – natural – alternative to nylon. Just as we were leaving were approached by a viewer and the owner of Tuku Wool, and presented with a bag of 50 gram skeins. Tuku Wool is made in Finland from 100% Finnish wool – a blend of Finnsheep and a Finnsheep-Texel cross. 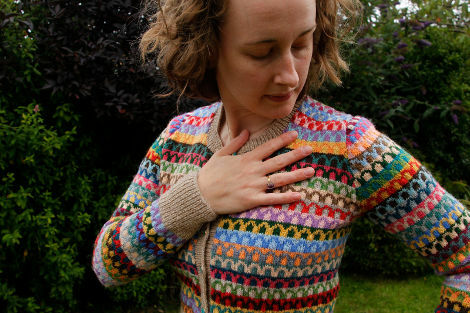 It’s a beautiful selection of colors and Andrea is tending towards a Fair Isle vest. 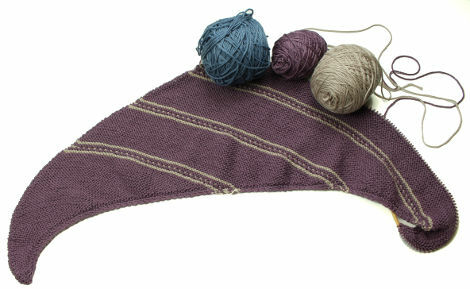 My Drachenfels is coming along – the third color will be making an appearance soon. I haven’t done any calculations, but I think I’m still on track to complete it in time for my mum’s birthday (late May). Fruity Knitting Get Together Offenbach, 29 April. Should be more details at the Ravelry group. Hiking Jacket Pattern Andrea has committed, it’s going to happen. 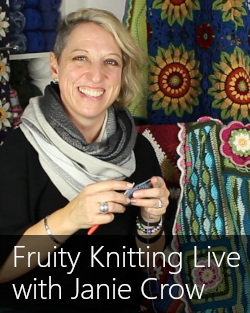 Fruity Knitting Live with Ann Budd Live event for our Shetland Patrons. Shetlands can get their questions in on the Patreon post. The recording will also be available for our Merino Patrons. 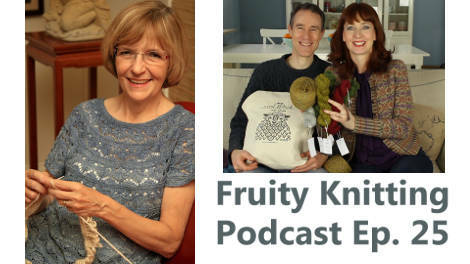 We would love you to help get the word out about the Fruity Knitting Podcast. Lots of people have never heard of the show, so please give us a mention as you see fit. Thank you! Thank you so much for posting the video tour of Edinburgh Wool Festival. One more wool festival to add to my bucket list after retirement! On Kate Davies 3/24/16 post Felicity Ford sings a song about Buachaille. It is wonderful and you will hear the proper pronunciation. Love your podcast! Thank you for what you are doing. I took a workshop with Gayle 2 years ago and am thoroughly loving working with Japanese patterns. They are stunning. I think the biggest challenge is resizing especially if the pattern is complex. But the rewards are well worth it. Thank you for doing the wonderful interview. Andrea, what was the cardigan you were wearing on this episode? Thanks for the details. I enjoyed the Japanese Seqment and just located a copy (on ebay) of Knit Couture Issue 9–coming from Japan. Gayle Roehm’s work inspired me. Thank you for showing my blanket. I’m loving these colours so much. Can’t wait for the edging.